As adults with responsibilities, we tend to go through life with a heavy load of concern about our needs. We tend to be unduly concerned about whether our needs will be sufficiently met, whether they will be met in a timely manner, or how they will be supplied. However, the Bible lets us know that this undue concern that we tend to have relative to our needs is not of God. When Jesus delivered His “Sermon on the Mount”, one of the main topics that He addressed was our needs. More specifically, He covered the fact that God understands, knows about, and will provide the means for our physical, material, and temporal needs to be met. In this verse 7, Jesus tells us that getting our needs met is not something we have to become worthy of by reciting lengthy affirmations, chants, or incantations. Moreover, Jesus tells us in verse 8 that God is so connected to us and in tune with us and our situations…that He understands and knows about what we need even before we recognize the need ourselves. In this verse 9, Jesus tells us to recognize God as our Father…to acknowledge His heavenly omniscience…and to start our prayers with worship. In this verse 10, Jesus tells us to pray from a place of complete surrender and submission to God’s will. In this verse 11, Jesus tells us to pray directly and assertively that God give us our daily needs. 12 And forgive us our debts, as we forgive our debtors. 13 And lead us not into temptation, but deliver us from evil: For thine is the kingdom, and the power, and the glory, for ever. Amen. In this verse 25, Jesus instructs us to not obsess over how we are going to live and survive…He tells us to not obsess over being able to get food, water, clothing, and shelter. Then, he finishes by pointing out that in God’s eyes, our life is about more than just eating and our body is about more than just clothing to protect us from the weather. In these verses 26 and 30, Jesus reveals how God takes care of birds and land. Then, He points out that we are much more valuable to God than birds and land. And finally, He asks us why we have so much fear, anxiety, and negative-expectation around God supplying a way of provision and sustenance for us. In this verse 31 (and in the preceding verse 25), Jesus gives what is for many people one of the most difficult commandments in the entire Bible: we are not to worry, fret, stress, or obsess over how our needs are going to be met. In reading the Bible, we can see that this verse 31 goes at least as far back as the Children of Israel and their exodus out of Egypt and their journey through the wilderness. Namely, the Children of Israel could never get to the level of faith that God would provide them with the food, water, protection, and shelter that they needed. If what they needed was not in hand, then they were complaining and doubting…and wishing they were back in Egypt. In this verse 32, Jesus restates what He stated back in verse 8. He does this to emphasize to us that God knows and understands that our well-being and survival depends upon our needs being met. Sometimes, our thoughts, attitudes, and actions indicate that we have forgotten that God designed and made us. But, we can rest assured that God well understands our needs for water, food, clothing, and shelter…and He understood our needs before we ever existed. In fact, when we read the creation story in the book Genesis, we find that God supplied the means for our needs to be met before He ever created us. Back in verses 25 and 31, Jesus directly told us to not worry, fret, stress, or obsess over getting our needs met. And now, here in verse 33, He tells us what to do instead: seek a deeper, richer experience, connection, and relationship with God and seek to incorporate God’s righteousness into our way of living and operating. Moreover, Jesus promises us that IF we will do this, then a way for all of our needs to be met will be supplied. Now, this verse 33 is one that we Christians are very familiar with. It is a verse that is very plain and easy to understand. Moreover, it is a verse that is a commandment with a promise. And yet more often than not, we foolishly seek the satisfaction of our needs and wants first and the things of God last. It is this very refusal to trust and to obey God that creates instability, volatility, and delays in getting our needs supplied and met. In short, Jesus is telling us in this verse 33 that if we will take care of our spiritual needs first, then that clears the way for our material needs to also be supplied. This is a very popular verse in the Bible. Christians love to quote this verse…especially when they are wanting something or needing God to do something for them. But, notice the word “according”…because this is the bottleneck in our lives…this is the bottleneck that limits what God will do in our lives. God indeed has unlimited power…He has the ability to do far more than we could ever ask or think. But, He only works ACCORDING to the power that is working in us! There is a level at which we all want God moving, working, helping, and doing in our life…and what we have to understand is that in order for God to move in our life at the level we want Him to move, we must have a corresponding level of His Spirit and power WORKING in us. We will only receive up to the level that matches the level of the power of God’s Spirit WORKING in us. This is precisely why Jesus told us to seek the Kingdom of God and His righteousness FIRST. When we have the power of God’s Spirit working in us, all these other things that we want God to do for us, with us, and through us CAN happen. Back in verses 25 and 31, Jesus told us to not worry, fret, stress, or obsess over how our present needs will be supplied and met. Now, here in verse 34, He goes farther and tells us that we are not to worry, fret, stress, or obsess over how our future needs will be supplied and met. Why would Jesus tell us this? 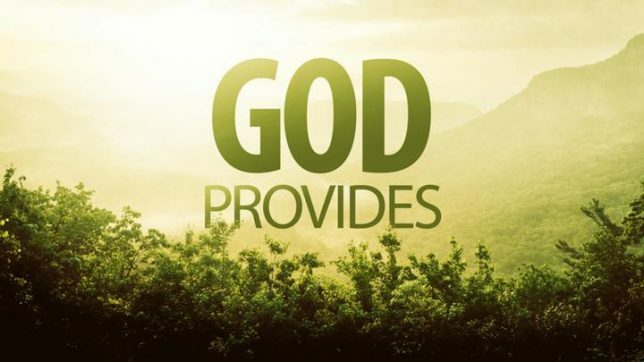 He tells us this because He knows that when we come to the future, God will at that time provide us (His beloved children) with a means by which our needs can be met and supplied. In this verse 6, Jesus is covering multiple points. One point is that there are some people that we should have no dealings with (money-wise or otherwise). Another point is that there are some people that we should not try to help because it will only be a waste and a loss of what God has provided us with. And, another point that could be extrapolated from this is that if a person is wasting their money on ungodly, non-Christian things, then they should not expect much help from God. Now, God has seen to it…or will see to it…that there is more than enough supply to meet our needs. However, an existent supply is not the same thing as a received supply. And so, this formula points us to the three things that we must do in order for our needs to be met…that is, in order for God’s provided supply to become our received supply. First, we must ask God for what we need or want…because in asking, we are acknowledging and honoring God as the ultimate source and supplier of our needs and wants. Moreover, asking is what connects us spiritually to God’s supply that He has for us. In other words, we must receive our needs spiritually before we can receive them physically. Second, once we are connected to our God-provided supply spiritually…once we have received our supply spiritually…then we are ready to seek…that is, we are ready to begin seeking a source for our supply in the natural. Typically, our mental abilities (thinking and learning) are most important during the seeking process. As we persist in seeking, we eventually find…we eventually come to a source, way, means, or facility by which our need can potentially be supplied to us in a physical, material form. Third, once we have found a source from which we can potentially receive the supply that God has for us, then we are ready to knock. Typically, our physical abilities (work) and our relationship skills (social) are what we use most in the knocking process. As we persist in knocking at potential sources of supply…sometimes experiencing delays, disappointments, and setbacks along the way…a source of supply will eventually be opened to us…where our needs will be delivered to us in a physical, material form…at which point we have completed the process. To illustrate this process, let’s refer back to Matthew 6:26 which tells us that God has provided the supply for birds to be fed. But, God does not put worms, bugs, and grains in the birds mouths. Rather, birds must do their part in order to receive and partake of that provision. So, each day, birds go looking for their God-provided provision (seeking). And as they are out looking, they come across (find) potential sources of provision…where they immediately begin scratching and digging (knocking)…and soon enough, they physically receive God’s provision (opened) in the form of worms, bugs, grains, and so on. Now, let’s note here that birds do not succeed in obtaining food every single time they scratch or dig (knock) somewhere. In some instances they succeed in obtaining food and in other instances they do not. If they fail to obtain the food they need in one area, then they just move on to another area…they just continue “seeking” and “knocking”…until they succeed. Even powerful hunters like lions and tigers typically have at best a one in twenty success rate. That is, a lion or tiger frequently has to “seek” and “knock” at least 20 times before it succeeds in obtaining the food that it requires in order to survive. Now, if a lion or tiger has failed 19 times in a row to obtain its food, does it throw a mad fit? Does it get angry at God? Does it accuse God of not supplying its need? Does it start questioning God’s existence? Of course it does not! It just heads out for its next hunt…it just takes off on its next “seeking” and “knocking” expedition…KNOWING that soon enough, it WILL obtain that which it has need of. The point is, there is much we can learn about “faith” from just observing the creatures God has created and how they receive their supply from Him. In these verses 9 through 11, Jesus points out that even in our human imperfectness, we love our children and give them the good things that they ask of us. And, if we will do that in our imperfectness…then how much more will our all-perfect Father God in Heaven provide us with the way and means for us to get our needs met? So, the crux of the above-mentioned portions of Christ’s message to us from the Sermon on the Mount is that we are to fully trust and believe that God will at every stage of our life provide a way and a means by which our needs will be supplied. And, all we have to do to receive that supply in a physical, material form is follow the A.S.K. formula (Ask, Seek, Knock) that Jesus gave us. So yeah…God supplies and provides…FOR OUR NEEDS. He. Just. Does. Always! And, all we have to do to receive it physically is Ask, Seek, and Knock.